A guide to creating vegan versions of staple ingredients to stock the fridge and pantry — from dairy and meat substitutes such as vegan yogurt, butter, mayo, bacon, and cheese, to mustards, dressings, pancake mix, crackers, pasta sauces, cookies, and more. Kitchen crafters know the pleasure of making their own staples and specialty foods, whether it’s cultured sour cream or a stellar soup stock. It’s a fresher, healthier, more natural approach to eating and living. Now vegans who are sick of buying over-processed, over-packaged products can finally join the homemade revolution. 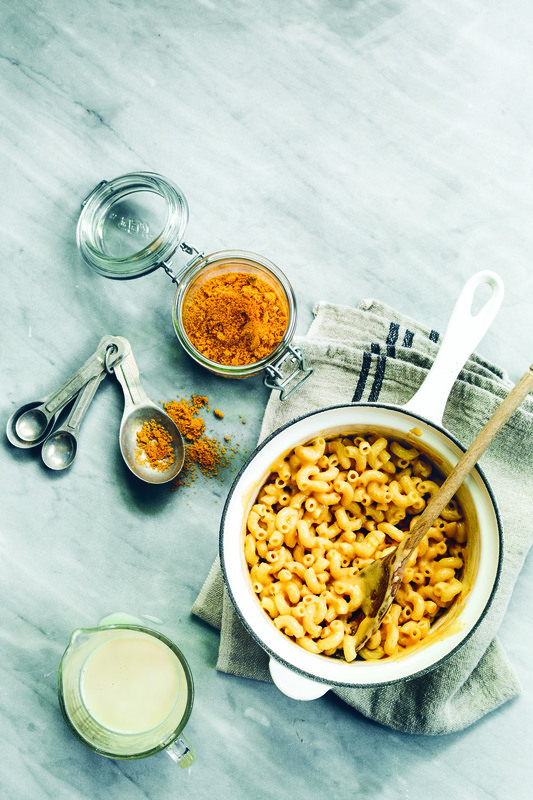 Studded with full-color photos, The Homemade Vegan Pantry celebrates beautiful, handcrafted foods that don’t take a ton of time, from ice cream and pizza dough, to granola and breakfast sausage. Miyoko Schinner guides readers through the techniques for making French-style buttercreams, roasted tomatoes, and pasta without special equipment. Her easy methods make “slow food” fast, and full of flavor. Miyoko Schinner appears with The Homemade Vegan Pantry at Omnivore Books on Food on Sunday, June 28 from 3 to 4 p.m.
Reprinted with permission from The Homemade Vegan Pantry: The Art of Making Your Own Staples by Miyoko Schinner, copyright © 2015. Published by Ten Speed Press, an imprint of Penguin Random House LLC. You can purchase The Homemade Vegan Pantry at your local bookshop or through our affiliate links with IndieBound or Amazon. Recently, I found the old recipe. It starts out calling for 250 pounds of vital wheat gluten. Well, a few adjustments had to be made, of course. But over the years, I’ve had people ask me if I was ever going to include the UnRib recipe in a book … so here it is (almost). These are quite addictive, and I have to hide them from myself so I don’t keep eating them. They really improve in flavor from sitting for a day or two, so make them ahead if you can. Then just keep them around for noshing. To make it easier for folks, I’ve changed the technique slightly, giving you the option of making them low-fat or not. When I think of ribs, the words smoky, chewy, and savory certainly come to mind, but the word that tops it all is greasy. That flavorful grease dripping down your chin is one of the highlights, don’t you think? Maybe not … so there’s a version for you, too! Both versions are tasty, and I enjoy them both. Make a bunch, freeze them, and you can thaw, slice, and cook them whenever you want. to the slurry and mix well, either using the food processor or by hand in the bowl. Roll the dough into a log about 6 inches long. Slice the log lengthwise into four “steaks” about 3/4 inch thick. Now here’s one of the places where you get to decide whether or not to use oil, and how much. Heat a skillet over medium-low heat—if you’re going for oil-free, make sure that it is nonstick. If you’re using oil, add a couple of tablespoons to the skillet and let it get hot. Add the steaks and cook until browned on both sides. They will rise and puff a little. Preheat the oven to 350°F. If your skillet is ovenproof, you can just leave the steaks in the pan. If not, transfer them to a baking dish. Mix 1 1/2 cups of the barbecue sauce with the water. Pour the diluted sauce over the steaks in the pan and cover with a lid or aluminum foil. Bake the ribs for 75 to 90 minutes, until the sauce has reduced and just barely coats them and the steaks are chewy and cooked through. They will be relatively tender while hot but will deflate slightly and become chewier as they cool, so fear not if they seem too soft right out of the oven. Let them cool until they can be handled without burning your fingers. Then slice each steak lengthwise into “ribs” about 1/3 to 1/2 inch thick. Heat the skillet over medium-low heat. You’re going to sauté the individual ribs once more to brown or even blacken them on both sides. Once again, you can choose to oil or not to oil. 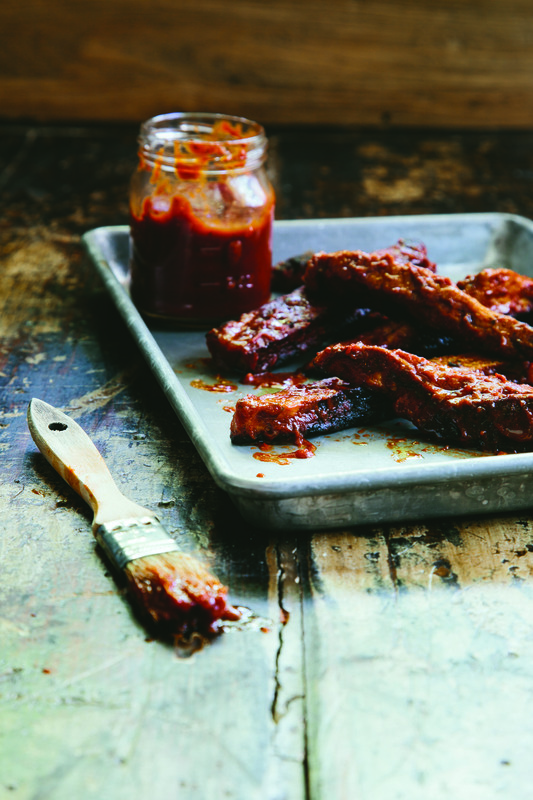 If you like your ribs on the greasy side, you’ll want to use a good 4 to 6 tablespoons of oil to sauté them. Or you can just use a dry nonstick skillet. Cook them all until nicely dark on both sides (I like them almost black). Then toss them with the remaining 2 to 2 1/2 cups barbecue sauce. Now you can dig in. Or wait until the next day, when they will have deepened in flavor and become even chewier. To reheat, just throw them in the oven or on the grill, or eat them cold with some potato salad—yum! Store in an airtight container in the fridge for up to 1 week or in the freezer for up to 6 months. out of the box. My kids would plead with me to buy it, and I was thrilled when the vegan stuff came on the market. Maybe you don’t crave it anymore, but it sure is convenient to have some on hand for the kids or the babysitter. But there’s no need to buy it, because you can make the instant cheese sauce mix yourself in just a few minutes! This version is richer than the variation that follows, utilizing glorious cashews. Add all of the ingredients to a food processor and process until a powder is formed. There should not be any discernible chunks or large granules of cashews, so this may take 3 to 4 minutes of processing. Store this in a jar or portion out into 1/3-cup increments and put in ziplock bags and store in the pantry for a month or two or in the refrigerator for up to 6 months. Cook 1 cup of dry macaroni according to package instructions and drain. Combine 1/3 cup mix with 1 cup water or unsweetened nondairy milk in a saucepan over medium-low heat. Whisk well and bring to a boil. Simmer for 1 minute, then toss with hot cooked macaroni. These mixes are also a great answer for turning yesterday’s leftovers into a quick casserole. Just combine leftover pasta, potatoes, or grains, some veggies, and any other odd scraps you think might be a good fit and mix it in a casserole dish with some of the cheese mix and water. You can add additional spices and herbs if you wish. Then bake it all up into creamy goodness. You can also use the mix to make quick sauces for veggies or add it to soups for extra cheesy flavor and richness—it’s quite versatile. With this in the pantry, you’ll have no reason to deny yourself a chocolate fix when the mood strikes. If you’re looking for that perfect chocolate cake—rich, complex, but light—look no further. 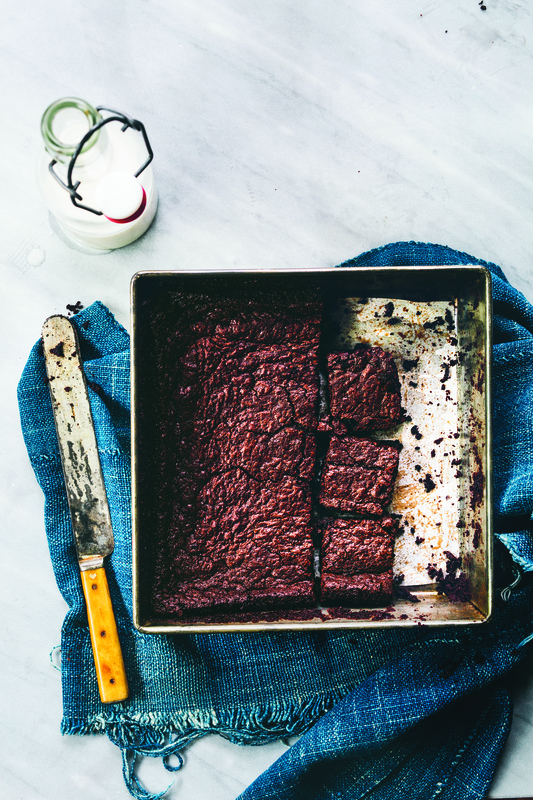 How about deep, fudgy brownies (pictured opposite)? It’s right here. Or almost guilt-free and oil-free chocolate muffins? Got those covered, too. Best of all, if you have kids like mine who tell you at ten o’clock at night that they need a treat to take to school the next day, you’ll be the supermom who can whip out amazing desserts “from scratch” in moments. 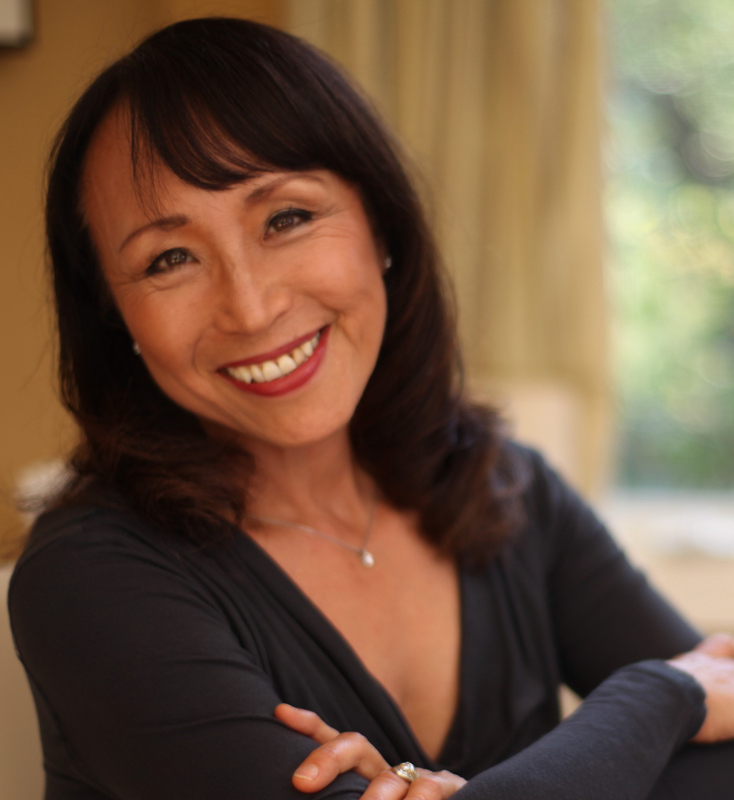 Miyoko Schinner is a vegan chef, author of three cookbooks ( Artisan Vegan Cheese, The New Now and Zen Epicure, and Japanese Cooking), co-host of Vegan Mashup on the Create Channel, and star of her online show, Miyoko’s Kitchen. She is a regular cooking instructor in the nationally renowned McDougall Program and at major vegan festivals and events around the country. Schinner has appeared in numerous publications and on television and radio, including VegNews, Chicago Tribune, LA Weekly, NPR, ABC World News Tonight, San Francisco Chronicle, Washington Post, New York Post, and Eating Well. Visit ArtisanVeganLife.com. This entry was posted in Eat, Eat: Book Excerpts, Eat: Recipes and tagged chocolate cake, Eat, macaroni and cheese, Miyoko Schinner, recipes, unribs, vegan. Bookmark the permalink.